I have over my life enjoyed steam and model railways, in many forms. 0H Guage Hornby Clockwork Wind up 0-4-0 Loco and rolling stock, track layout hand built by my father. Double O Guage layout shared with my brother in law. "N" Guage layout, mainly built for a vehicle to allow sceanic modeling. "Z" Guage layout, Very tiny and apart from the novelty, vary hard to model sceanery. Here is a snap shot of the current railway, direct from inside the computer, I am running a model of a locomotive built in Guage one, by my father over twenty years ago, on the Settle to Carlise railway. Complete with Sound and full animated motion, all that is missing is the smell of the steam and hot oil. There are a lot of models on the internet, one of which is in the photo above, I have also found a version of Stephensons Rocket and some Neat little Shunting Loco's. A Heritage produced addon, providing a range of diesels, with first class british Passenger and Goods Rolling stock. A good, but modern London to Brighton route, Some Scenic detail is a little slapdash. Better than the London to brighton route on detail. This is a fine detail stretch of modeling, almost as fine as the MSTS originals. 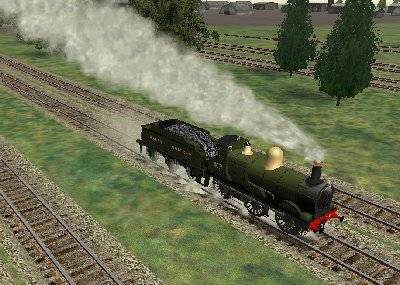 Still one of the best addon packs for MSTS, with fine detail modeling, even better than the MSTS originals. For a lad who used London Bridge and the South East line, this is an, " had to have " addon.